Today, I'm featuring the cake-lovin', Ridge from Maybe Someday-fangirlin', bloggin' with the kiddies every chance she gets, NICOLE from FEED YOUR FICTION ADDICTION! 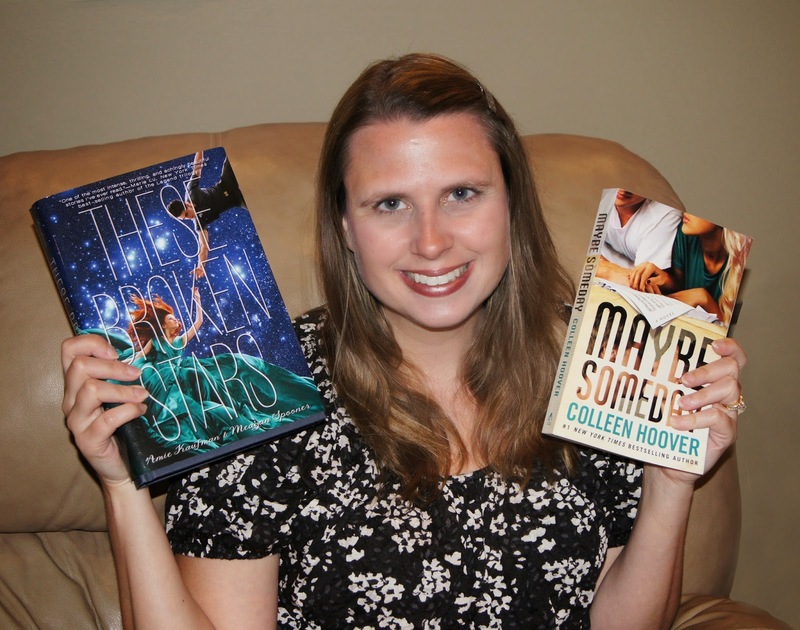 Nicole's favorite books are Maybe Someday by Colleen Hoover (LOVE IT!) and These Broken Stars by Amie Kaufman. What was the very first post you ever made on Feed Your Fiction Addiction? A very short, general welcome post. Where is your favorite place to read? Cookies, cake, or carrots while reading? Out on the deck or in bed. I’d always choose cake – reading or not. Me too! If Feed Your Fiction Addiction had a theme song, what would it be? This song is gonna be stuck in my head for the rest of my life now, lol. Great choice. So you also have a site where you review children's books, called Best Kids' Reads. What gave you the idea to start this site and how cool is it to review books with your children? I just really enjoy reading books along with my kids and thought it would be great to spread the word about all the great books we read together. I’m not nearly as active on that blog, but recently my kids have decided to do some reviewing on their own and they’re putting up posts! Tell us about your experience at BEA 2014. Was it as awesome as it looked? Who did you meet and what books did you collect? BEA was AMAZING, mostly because of all the fantastic bloggers I got to meet! There are WAY too many to list here, but check out my blog for my BEA recaps to hear all about it. Of course, I also got to meet lots of amazing authors – some of my favorites were Julie Kagawa, Jennifer L. Armentrout, Kiera Cass, Kresley Cole and A.G. Howard. I think I brought back around 75 books in all (including Middle Grade books that I plan to read with my kids). WOW! That sounds like so much fun and I'm kicking myself for missing it. But next year, I'm there! The best thing is definitely being a part of the blogger community and talking books with other people who are as obsessed with them as I am. The worst thing is how much time it takes (just ask my husband!). Yes, there really isn't enough TIME in the world for this blogging stuff, is there? But I totally agree about the blogging community. It's awesome! If you were a Disney Princess, name an actress to play your evil stepmother. Because all princesses have an evil stepmother, right? Lena Dunham – I love her, but she seems like a perfect evil stepmother type. Next week I'll be interviewing Stephanie from Curling Up By the Fire! See you then!